Former minister of Aviation, Femi Fani-Kayode has invariably told the Inspector General of Police, Ibrahim Idris that in a democracy, the police have no right to order people around – saying a police invitation should not be of short notice and must expressly indicate reasons for the invitation. This was inferred from a letter written on behalf of Mr. Fani-Kayode by his lawyers, Kayode Ajulo and Co, in reaction to the invitation extended to him by the Police over alleged conspiracy, criminal and inciting publication. Lawyers to the former aviation minister categorically told the IGP that due to the short notice and failure of the police to state in clear terms the purpose for the invitation, their client would not honour the invitation for now. Recall that the Police had in a letter dated August 20, 2018, asked the former minister to appear before SP Usman Graba on August 28, 2018 over ‘conspiracy, criminal defamation, inciting publication, injurious falsehood and conduct likely to cause breach of peace’. 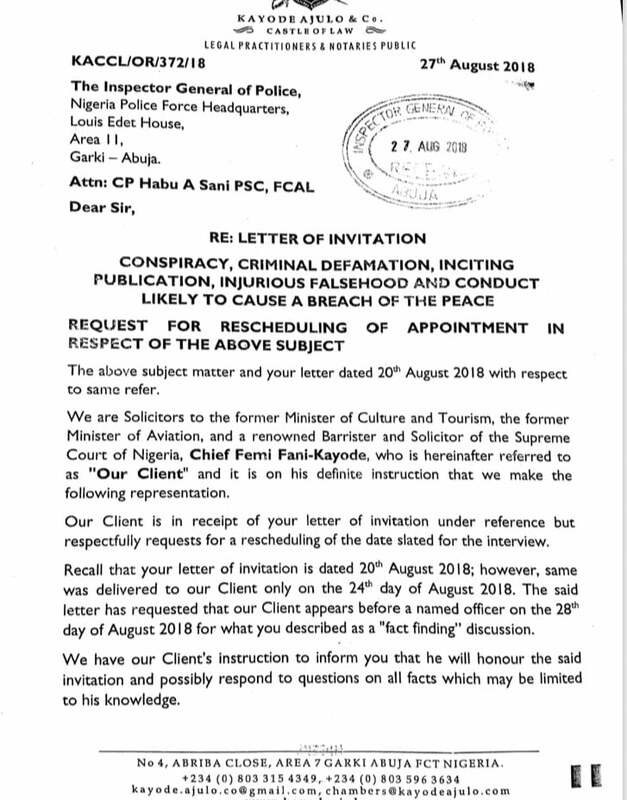 Fani-Kayode’s lawyers have demanded “essential particulars of the purpose of the visit” pointing out that the letter appeared “in a vague and ambiguous form”. 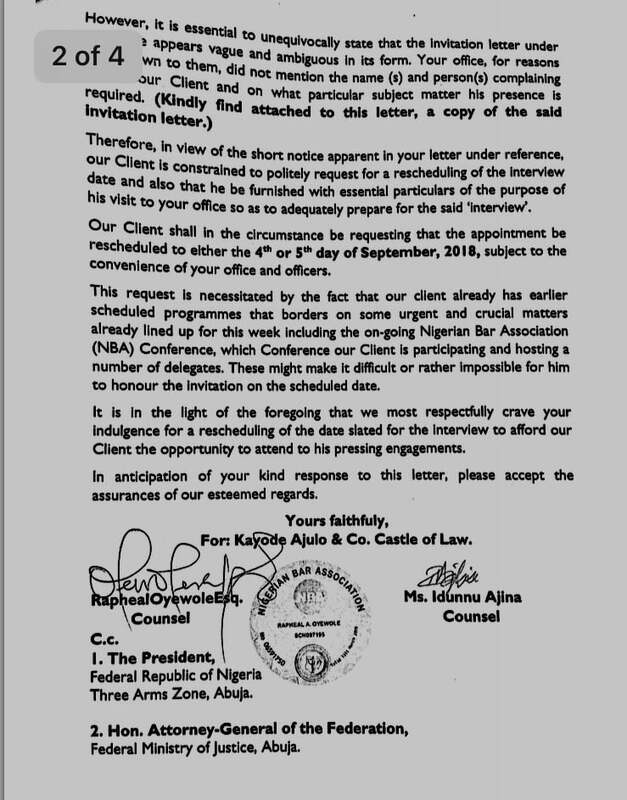 The letter partly read, ”Your office for reasons best known to them, did not mention the name (s) and person (s) complaining against our client and on what particular subject matter his presence is required. ”Therefore, in view of the short notice apparent in your letter under reference, our Client is constrained to politely request for a rescheduling of the interview date and also that he be furnished with essential particulars of the purpose of his visit to your office so as to adequately prepare for the said ‘interview’. ”Our client shall in the circumstance be requesting that the appointment be rescheduled to either the 4th or 5th day of September 2018, subject to the convenience of your office and officers.